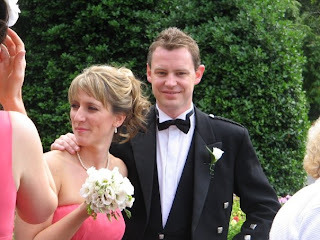 My sister was wed on the 18th July and the ceremony and reception were beautiful. A number of you have asked to see pictures of the blushing bride. I have been waiting to get some pics of the bride and groom uploaded onto this site, but sadly a picture of Andrew and myself is the best that I can do for now. Please watch this space as the professional pics are due back any day now! My family are all much relieved that it went so well, but my mother is now at a bit of a loose end. She is currently putting all of her energies into planning my wedding... only one year and 2 months to go! My friend Joe took some new pics for the website at the weekend so I should have a fresh shiny fresh looking website by September. The new 8 week block will start on August the 31st. The Yoga Room will be closed for two weeks from the 17th of August. I am going to take this time to gather my strength and relax at my folks caravan in the beauty of the West coast. Booking forms for next term will be on-line from next week. This summer was very busy and I had to put a number of students on a waitlist for September. I will be contacting all of these people shotly, so please be prompt in booking as I anticipate another busy term.